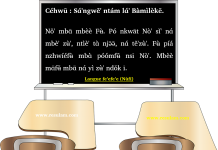 Swahili, also known as Kiswahili, is a Bantu language and the first language of the Swahili people. It is a lingua franca of the African Great Lakes region and other parts of eastern and southeastern Africa, including Tanzania, Kenya, Uganda, Rwanda, Burundi, Mozambique and the Democratic Republic of the Congo. 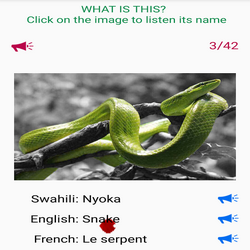 This trilingual application (Swahili – French- English) is probably the first of its kind in the world. It combines image, sound and writing, and facilitates learning the language from the most basic level. 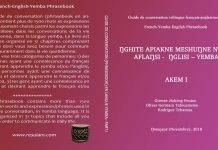 This first version is composed of 12 chapters carefully organized, and other chapters will certainly follow thereafter. We recommend you to patiently browse through the application while focusing on the three above-mentioned aspects, namely writing, pronunciation and images. – Learning mode: Here you can quietly learn the lessons. – Dictionary mode for a quick search of the terms included in the database. The Setting option allows you to change the background of the application, or to choose the sequential mode. Sequential mode allows you to browse the terms exactly as they are in the database. This mode is particularly useful when learning numbers. Tip 1: Stop the music before the beginning of learning mode. N.B. We intend to develop this application for every minority language in the world. So if you are ready to contribute, please send us a mail. N.B. 2. For low resolution phones like Techno y4 for example, parts of the application, such as quiz, will not work well. 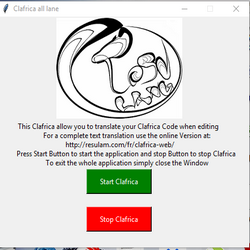 If you like the project, please support us so we can easily develop future applications. 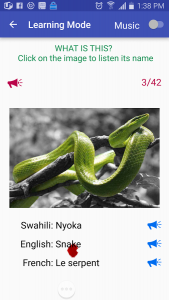 This application could not have been made without the help of Mr Agapiti Shayo from Tanzania. Thanks a million sir.